Much like opera, video games are an incredible amalgamation of the arts. With unique gameplay, distinct character design, and engaging story-lines the cult favorite Persona game series is lauded for it’s dynamic soundtracks. In the recent release of Persona 5, this love of music bursts forth with a character we at Boston Lyric Opera know all too well, Carmen. A constant within the game series is that protagonists have the ability to summon a manifestation of their psyche known as a Persona. The design of these powerful entities in past games have orbited around Greco-Roman and Japanese mythological figures. In Persona 5 this shifted to focusing on infamous historical or literary figures such as Arsène Lupin, Zorro, Captain Kidd, Pope Joan, and Carmen. Another constant in the series is the idea of shadows, enemies you fight in dungeons where reality is distorted. In Persona 5 these dungeons are known as Palaces wherein reality is warped by strong negative and corrupt thoughts of an individual that warp perceptions causing harm to people in the real world. The main characters of the game seek to destroy these Palaces to end the crimes of the individual who created them. 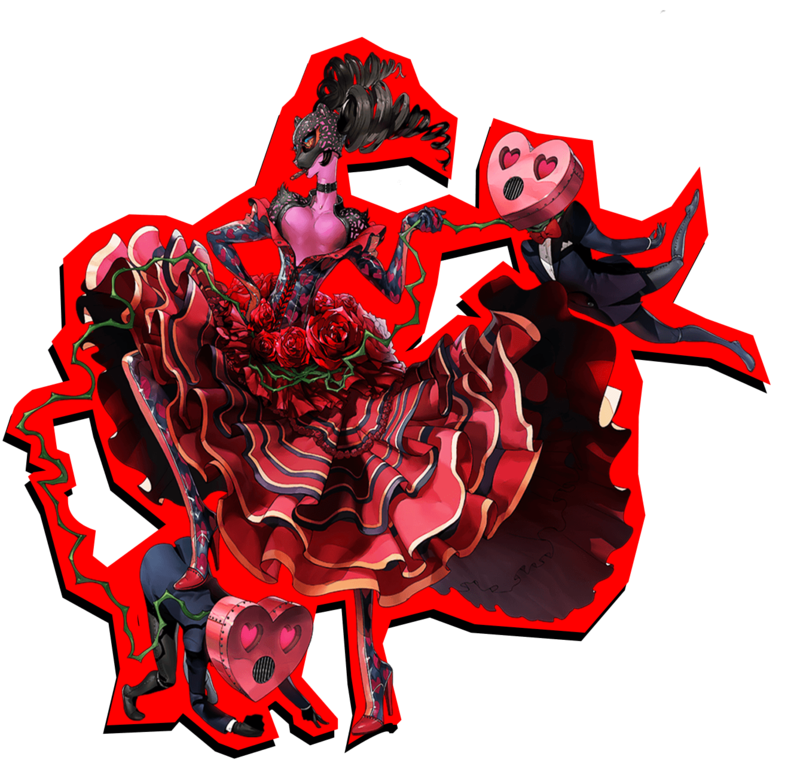 Carmen is the Persona for one of the main playable characters, Ann Takamaki, and is summoned in the first Palace of the game. This Palace is one that is created by the shady volleyball coach Suguru Kamoshida stemming from his twisted perspective that the school is his domain, one he can rule as a king doing whatever he pleases. Playing as the silent protagonist we first see Ann reluctantly entering Kamoshida’s car. She is standoffish at first, unpopular with other students, and the subject of a rumor circulating about her and the coach. Keeping to herself she has only one friend, Shiho Suzuki a hardworking member of the volleyball team. It is revealed that Kamoshida is treating the volleyball teammates poorly, abusing them, and that Ann is forced to interact with him in order to protect her only and best friend Shiho. Kamoshida’s abuse escalates causing Shiho to attempt suicide pushing Ann to seek revenge and follow the main characters to Kamoshida’s Palace. A Shadow version of Kamoshida is found here and he blames Ann for avoiding his advances causing him to seek out her only friend. With motivation from the other characters Ann finds the strength to avenge her friend, the other victims, and for herself. This change of heart, this inner voice, awakens Carmen. At first, Carmen seems an unlikely pairing for Ann. Ann is reserved, arguably lonely, and at the beginning of the game isolates herself from fellow students. However, she is self-sacrificing caring deeply for those close to her, becoming fiercely protective of her friends. She is driven by a desire to help those who may not be able to help themselves and to uplift the spirits of those around her. This burning passion is an obvious connection to Carmen. Yet, this summoning connotes a gain of autonomy. At the beginning of the story she is objectified; by Kamoshida but also by rumor spreading students who see view her pretty appearance equivocal to a shallow personality. Carmen joining her awakens Ann’s rebellion. With Carmen, Ann has not just gained the power to fight for herself she also achieves a sense of freedom. Her fate is in her own hands, she will no longer allow herself to be used by men. Persona keeps a consistent style throughout the series with its design elements, game mechanics, but also through its use of music. It is clear that music is an important part of this series’ aesthetic. Indeed, this is not the first time opera has appeared in the series. In Persona 2 an opera singer Belladonna resides in a space of the game known as The Velvet Room; this room and associated theme carries through each game. These references only instill further this series’ love of music. We can muse at what future opera references this series may make or create! What was once considered low art is now esteemed, will video games eventually have a similar trajectory? Stay tuned for more in this blog series exploring the cross section between opera and fandom culture.